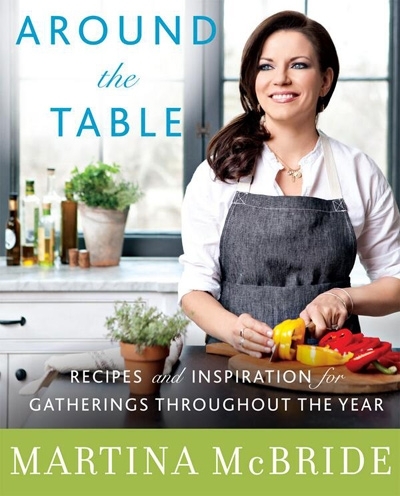 If you watch or DVR the daytime shows, you probably remember seeing Martina McBride recently making the rounds with her new book, "Around the Table: Recipes and Inspiration for Gatherings Throughout the Year." Besides having a successful music career, turns out Martina has a passion for entertaining too and, because it's such a daunting process for so many of us, she wanted to bring a book to the public that would show step-by-step how we can do it too. There are lots of books offering recipes for entertaining, but Around the Table covers all the bases with themed dinner parties, full menu ideas, decorating tips, and ways to set both the scene and the entire vibe of the party, including some great music playlists - of course - and plenty of recipes! In her introduction, Martina walks you through the entire planning process, from theme inspiration, to set up, planning, wine pairings and even a Libation Calculation chart to help calculate how much to buy. There's a three week out party planner and a quick list of things to remember that you may have otherwise forgotten about. You'll find tips and tricks to help save time and make your party a success, make ahead game plans for the entire cooking process for each theme, helping to ease those time crunch issues and keep you stress free the day of your party. Following that, are ten themed parties, each including a full menu covering all bases from drinks to dessert. The book begins with a "Fall Supper with Friends" focusing on a smaller, more intimate gathering of six, with cozy and comforting food. Italian friends helped to develop an authentic "Bountiful Tuscan Feast," providing an abundant and hearty meal, but one that is still informal and relaxed. "Family Pizza Night" is about reconnecting around the table with busy families and getting children and teenagers involved in the process, by helping to decorate, set the table and participate in little touches that help make the ordinary, special. The "Mistletoe and Martinis" party is about the holiday open house, a casual day where friends are invited to drop by during a range of hours, when they might be on their way home from shopping or making rounds to other homes. This allows for a short visit and a quick bite to eat, instead of an obligation to spend an entire evening in one place. "Retro Valentine's Day" offers up a vintage theme, focusing on the supper club party, with an intimate menu for six, when it's your turn to host. "Spring Brunch Outdoors" was inspired by the relaxing feel of a New Orleans Sunday brunch and focuses on that ambiance, offering a light, springtime brunch menu for a slightly larger group of ten to twelve. The "Red, White and Blue Cookout," celebrates classic 4th of July fixings, patriotic accents and homespun charm, and the "Bruschetta Bash," is a clever buffet of both sweet and savory, colorful toppings on crusty, toasted sliced French bread and finished with a S'mores bar. The "Red Wine and Vinyl" party, combines a wine, cheese and panini pairing with your guest's favorite iconic vinyl records and the "Taco Fiesta," focuses on lots of brightly colored place settings and decor, alongside simple and spicy, Tex-Mex favorites, and of course margaritas! With beautiful photographs and loads of inspiration, if you love to entertain, this is a great, all around book to guide you through some pretty cool parties your friends will enjoy and with all the planning laid out for you in simple steps, giving you the freedom to enjoy the party right along with your guests. If you have a friend or family member who has a passion for parties, this would make an excellent gift, giving them a fresh resource of party inspiration to draw from. Pick up a copy of Martina McBride's "Around the Table: Recipes and Inspiration for Gatherings Throughout the Year," at most major retailers, your favorite bookstore, or at online stores like Amazon. Disclosure: I received one free review copy of "Around the Table: Recipes and Inspiration for Gatherings Throughout the Year." I just discovered your site. I will be sending a link to all of my Southern relatives. You have many of the recipes that my Mother and Grandmother (knew by heart) used in their cooking. When we girls are together we try to think out what was in certain dishes and sometimes, we fail. You are a Godsend for those of us who did not pay attention when someone was trying to show us. Oh goodness, thank you SO much - I really appreciate those referrals and the encouraging words!! Honey and I saw her a few years back (2009 I think) with Blake Shelton, he was off the charts and she was even better. It was the last show of the tour so they really cut loose. He got up on stage at the end with her and they did a few songs together. Those are two talented entertainers there. I felt bad for Martina being up for a CMA the other night against Miranda Lambert who is on a career surge. Hard to beat her right now! Oh I wish I could! You're actually not the first person who has asked me for that recipe, but believe it or not, I have never had it. I guess I'm gonna have to make a trip over there and see what all this is all about!